When I hear people speak of themselves as “leaders,” frankly, I cringe, and I tend only to notice the signs of their inflated egos. Most authentic leaders are usually somewhat understated, well aware that leadership is not a status that enables someone to apply “proven” recipes, but instead a continuous self-rebuilding process in an effort to handle new situations. 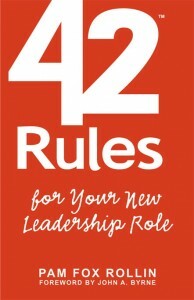 That’s the purpose of Pam Fox Rollin‘s book: 42 Rules for Your New Leadership Role: The Manual They Didn’t Hand You When You Made VP, Director, or Manager. On her website, Fox Rollin says that she “coaches leaders to succeed at the next level.” The truth is that succeeding at one level does not mean that you are ready for the next one. So restart your game plan and look at these 42 rules distributed into seven main stages – numbers that bear some analogies with Texas 42, in which the purpose of the game is to be the first team to reach seven marks. Set Yourself up for Success: No matter how “experienced” you are, each start must be a fresh start; otherwise, you face the risk of simply applying old habits in new situations. Take charge of your start. Map the Terrain: That’s the time to investigate what matters, identifying all the stakeholders and what is important to them to know where and how you will create value and eventually drive change. Show up Wisely: What you would “typically do” might be irrelevant, so beware of your knowledgeable ego and reassess yourself. Realize that leadership is never a solo game, but the art of empowering a team to empower yourself while showing them how to optimally work with you. Start your Wins: If your dream is fast glory, forget it. Build buy-in through small wins that enable you to know how people operate around you and get familiar with your style. Create mutual understanding instead of coercing people into following you blindly (they won’t, anyway). Create your Management System: It’s time to show how indispensable you are in the game and how efficient you are at driving performance. Yet, continue to encourage dissent and foster diversity. You won’t be a leader alone: leaders grow more leaders. Stay Smart: Resist the temptation to feel established after two months. Staying smart means staying current and capable, finding colleagues inside that will stretch you, and developing an industry presence. Powerful positions are only relative. The imagery around leadership is fraught with clichés (self-heroisation, impatience, arrogance, outspokenness, etc.) that set a lot of people up for failure. The quality of this book is to show that leadership has nothing to do with posturing, that it’s a talent that can be nurtured. By coaching yourself into becoming an effective leader capable of energizing your team, you not only establish your authority, but also coach others on how to follow into your footsteps.